A woman who was assaulted, stripped to the waist and handcuffed for 11 hours while pregnant is suing the police watchdog. Lynnette Wallace went into early labour 48 hours after her arrest in 2011. Misconduct proceedings against two officers have been dropped by the Independent Police Complaints Commission (IPCC) due to delays. 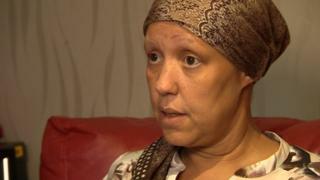 It has apologised but Ms Wallace, who has terminal cancer, said she would "fight this until her last breath". The 47-year-old told the BBC: "I'm pretty angry. I just think it was disgusting how I have been treated over the past six years. "I want to expose them all. I want it all to come to a conclusion." Image caption Ms Wallace said the assault at Bridewell police station was "disgraceful"
Ms Wallace had been arrested at 30 weeks pregnant on suspicion of arson with intent to endanger life and intimidating a witness. She was taken into custody at Bridewell police station where she was assessed as being at risk of self-harming and handcuffed. Two days later, she gave birth prematurely. Charges against her were later dropped. In 2013, Nottinghamshire Police found an inspector and two sergeants guilty of gross misconduct. The force publicly apologised in 2016 and settled a claim for damages. In May, a misconduct hearing against two officers was dropped by a force disciplinary panel due to delays by the IPCC in investigating the case. It said officers could not receive a fair hearing. The pair is still working for Nottinghamshire Police and have not faced any sanctions or other disciplinary action. Ms Wallace's solicitor, Carolynn Gallwey, said: "Lynnette's battle for accountability for the assault upon her has been fought on two fronts - with the police and with the IPCC. "The ultimate failure of the IPCC in that respect raises fundamental questions about their effectiveness, which they need to reflect upon in their current re-structuring." IPCC commissioner Derrick Campbell said: "We very much regret our part in the delays in this case and we have apologised to Ms Wallace for the frustration and upset caused. "There were some delays over which we had no control but we recognise our investigations took longer than they should have. We fully appreciate that Ms Wallace feels badly let down by the outcome." A Nottinghamshire Police spokeswoman said: "After carefully considering the submissions from all parties, the misconduct panel determined that it was not possible to have a fair hearing of the allegations due to delays and significant departures from the regulatory framework." The Police Federation said it had lodged a complaint against the IPCC on behalf of the officers. Spokesman Phill Matthews said: "This whole, drawn-out experience has had a devastating effect on the officers, although sadly they are not alone in facing lengthy investigation delays. It is something our members have come to expect."